The things you learn while paging though an encyclopedia looking for great images to share. This my friends is a bath chair. In my mind a bath chair is something you put in the shower when you have trouble standing. 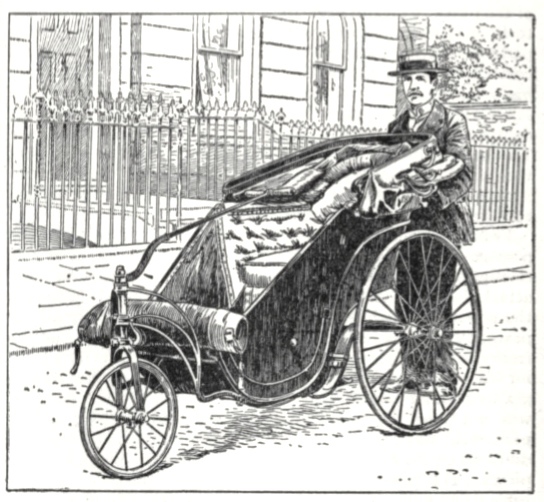 But, apparently James Heath, thought it would be the perfect name for his rickshaw-like conveyance that he invented around 1750. After all, he lived in Bath, England. Bath was a tourist destination and perhaps he designed the bath chair to help those visitors who were elderly or disabled. This bath chair drawing shows a model with 3 wheels. It has a folding hood and a glass front (I guess that folded down too). It could be configured to be drawn by a donkey or small pony.